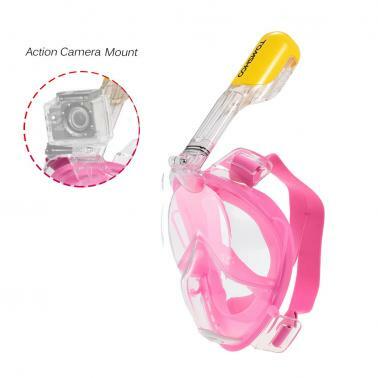 This diving mask has 180° panoramic viewing area with dry snorkel technology. Tubeless design prevents Gag reflex. DURABLE: Constructed of one piece shatter-proof and clear polycarbonate, which will guarantee a quality, long-lasting device to take on all your adventures. Never worry about cracked or split snorkel tubes. With our integrated mount for GoPro action camera, you can easily attach your camera to capture and share your adventure with friends and family. 180° FULL FACE DESIGN: Our mask provides a 180° viewing area- the biggest of any snorkel mask on the market today guaranteeing that you will see more fish and sea creatures than ever before. 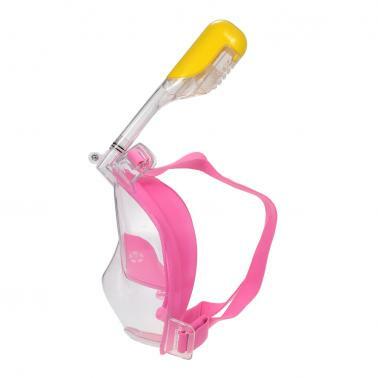 DRY SNORKEL TECHNOLOGY: Stops salt water from getting into your mouth and prevents gagging. Spend less time worrying about water in your mask and more time snorkeling! 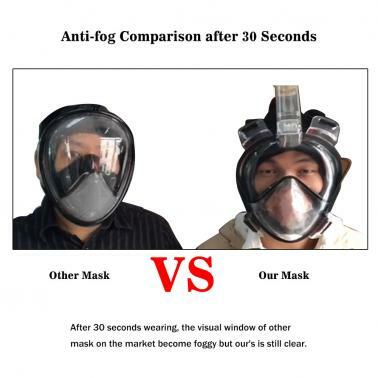 ANTI-FOG DESIGN: Our innovative design features 2 ventilation channels that create an airflow away from your main viewing visor that helps eliminates fogging and makes it easier than ever to breathe comfortably through your mouth or nose while you are snorkeling. EASY TO USE: Our snorkel mask fits for all swim newbies without any swimming experience. People can enjoy snorkeling who even cannot swimming when pairing with life jacket. 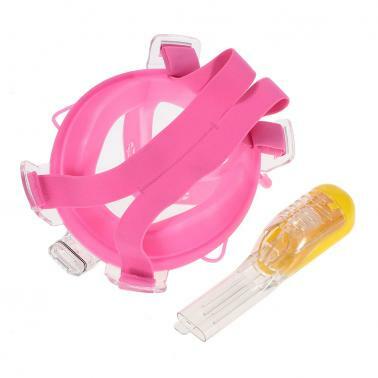 For diving lovers, this snorkel mask can solve the tired which people need to bite breathing tube for long time and inconvenience of guttation outward, saving physical strength and enjoying snorkeling better. COMFORT: Outfitted with comfortable silicon face padding, easily adjustable elastic nylon straps and waterproof ear plugs.